In reading the President Veazey’s “Counsel to the Church” in anticipation of the Community of Christ’s next general conference, I reflected on the general approaches to church governance represented in this document as well as our own tradition. Specifically, I was intrigued by the CoC’s apparent move to accept the baptisms of other Christians (noting that confirmation is still required). My gut reaction was incredulity. Rebaptism was central to early Mormonism. However, our tradition has equally diverged from early practice and so I think it is instead a great opportunity to look at how our own praxis evolves. Despite the recent writings of George D. Smith, derogatory comparisons to the Munster Anabaptists have historically been targeted at Baptists in all their flavors. Vitriol by the wagon load. Baptists weathered the criticism fairly well, but by the time of the Restoration, there was still tremendous theological resistance by those who rejected rebaptism. The earliest Mormon engagement in the debate is fascinating. It is fascinating to me that the voice of the Lord appears to associate non-Mormon baptism with the Law of Moses, something that is a valid, though no longer complete, mode of righteousness (see this interesting discussion as well). And the missionaries preached this new covenant of baptism and associated laying on of hands with priesthood authority with great success (also note that rebaptism was a significant controversy among the Campbellites). Parley P. Pratt, in his Voice of Warning used baptism as the means by which we become citizens of the Kingdom of God and his heirs through the law of adoption. Baptism had many meanings. However, unlike his first five years when Joseph Smith committed his revelatory innovations to writing , Smith generally left all of his Nauvoo revelations orally. Expanded cosmology, the Quorum of the Anointed, the Council of Fifty, Rebaptisms, and more. It was not until Orson Pratt trolled through the History of the Church in the 1870s in order to bring the 1835 Doctrine and Covenants up to speed that Nauvoo era materials were canonized. 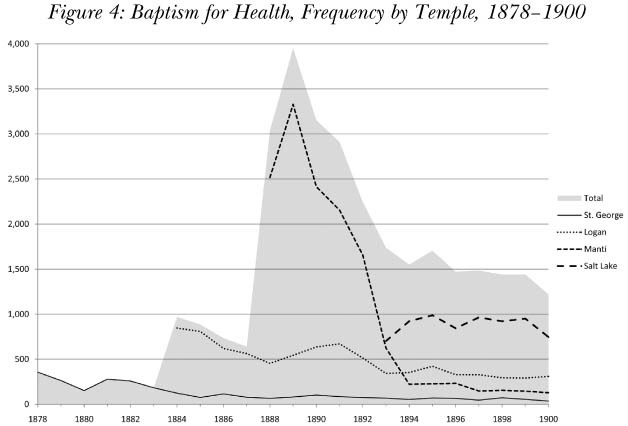 As you can see, rebaptism was generally ended in the last decade of the twentieth century (though it lagged on for a couple of decades) and baptism for health ended during the great liturgical reforms of the Heber J. Grant administration in the 1920s. While the move away from rebaptism was controversial in some quarters, baptism for health ended with no significant comment. As the debates surrounding these forms of baptism in the governing quorums show, however, Church authorities did not know where the practices came from. When Pratt updated the Doctrine and Covenants, he was neither critical nor exhaustive. Furthermore, whereas the Reorganization went back to the 1835 Doctrine and Covenants and continued to expand it textually, the Utah church continued in Joseph Smith’s later tradition of not committing revelatory changes to text. Joseph Smith had no problem simply ignoring past revelation to make room for the new. The Utah church grew to be more conservative than that, but the result was that the living voice of God perpetually trumps all (though in recent years there is also a significant impulse to emphasize Joseph’s early revelations that are recorded). There is a tremendous flexibility in this non-cannonization mode of revelatory leadership. I’m not at all familiar with the current Community of Christ and how the move toward ecumenical baptism and open communion will be accepted. In their early rejection of Nauvoo theology, they also used rebaptism as a sign of the Brighamite apostasy. They accepted the baptisms of all Restorationist believers. Perhaps this perspective facilitated the current ecumenical shift. Jensen, et al., Manuscript Revelation Books, 35 [D&C 22]. Joseph Smith, “Conference Minutes,” Times and Seasons 3 (April 15, 1842): 763. I can’t recommend Robin Jensen’s recent Master’s thesis enough on this topic. “‘Rely upon the Things which Are Written’: Text, Context, and the Creation of Mormon Revelatory Records” (MLIS thesis, University of Wisconsin-Milwaukee, 2009). See ibid., for the most complete account of both. Fascinating stuff. Hopefully John Hamer will comment here. My sense is that the upcoming CoC World Conference is expected to be a challenging one for a variety of reasons. J, this is really interesting stuff. I know we’ve talked previously about the need for a history of baptism within the Mormon tradition. I wonder now if a comparative approach inclusive of various Latter Day Saint historical expressions of baptism might be a good approach. It could at least be a solid MHA session. Cool stuff, J. I hope you extend your research on baptism. I don’t know how the restoration branches are doing these days. But the CoC’s drift to mainline Protestantism was what got them going in part. I wonder how this will be received. Perhaps the shakeout is done and this will go down without a hitch? Thanks for this post. Very interesting. Having a living prophet is somewhat of a double-edged sword. We get the benefit of words potentially “customized” to our time, yet at the same time, it does make defining what Mormons actually believe quite a bit more wishy-washy. Prophets have come down on both sides of rebaptism, blacks and the priesthood, polygamy, WofW, etc. Which of these is actually a “fundamental” belief? Thanks, folks. Christopher, I agree that there is a lot of very interesting work to be done, enough for several researchers. Such a panel would be excellent. Mike S., I guess it is only a problem from certain perspective. Your mentioning of “fundamental[s]” is perhaps right on. Did you happen to read my previous post on the topic? I think that any Christian baptism should be good enough for all Christian sects. Though it does get interesting when there are those sects which baptize as babies and those that do not. What do the other Christian sects do? StillConfused, this debate dates back a long time. The Council of Laodicea and Nicea treated heretical baptism. Generally, heretical triune baptisms were and are accepted by the Roman Church and most protestants. Many Baptists rejected infant baptism and enforced believers baptism (hence “anabaptists”). This was generally scandalous. What do the other Christian sects do? Disagree, debate, schism, go to war, kill each other by the million…. I’ve wondered how our use of the sacrament may fit into this. Many members speak of it as a renewal of baptism covenants, and it astonishes me a bit that until the block schedule 30 years ago, a typical ward member would participate in the ordinance in Sunday School and then again in sacrament meeting. Even today, there are those who will tell you they feel a lack in their spiritual lives when conference or something keeps them from the sacrament for a whole fortnight. Did the saints a century ago replace rebaptism with very frequent sacrament participation? I did read your other post and thought it was great. I think perhaps my choice of the word “fundamental” was wrong. The concept I was searching for was perhaps “core”. I think there are certain “core” beliefs that are eternal and unchanging. Some of these might include that God exists, that Christ died for us, that murder and adultery are wrong, that we should treat others with respect, that we should be honest, etc. Many other things are not “core” issues yet people seem to get so emphatic about them. These are the things I mentioned. People have been excommunicated at one point for rejecting polygamy, then for embracing it. People have been excommunicated for feeling too strongly about blacks getting the priesthood, yet I bet the opposite would be true today. Prophets have taught that “As man is, God once was…”, yet now they “Don’t know what that means”. When there are so many examples, it makes you wonder which of our current “policies” are actually “core” gospel principles and which are merely the personal preference of whoever happens to be in charge now. Mike S., I think the core of the Gospel is outlined by Christ himself – that he was raised up on the Cross, so that he might raise us up. I think the Core of the Church is that God restored the authority to administer salvific rituals. That said, the tendency to make lists of what is changed between two periods without historical contextualization smacks of the fundamentalist proclivity that I find troubling. As one who does not want to practice polygamy, thinks the priesthood ban was a mistake, and thinks that popular folks cosmologies have generally missed Joseph Smith’s point, I don’t really see the problem. That said, I don’t believe anyone was ever excommunicated for disbelieving in polygamy or the ban (though I agree that excommunication is likely for practicing converse today). Disparity in time are meaningless without the appropriate historical contextualization. Why and how did things change is the better question. Mansfield, that is an excellent question. One which I think gets at some very interesting concepts. I’m not sure that I can at present be definitive, but I agree that the sacrament of the Lord’s Supper was transformed after the end of rebaptism. Though there are a few 19th century examples, it is in the 20th century that you see the sacrament popularly described as a renewal of all covenants. 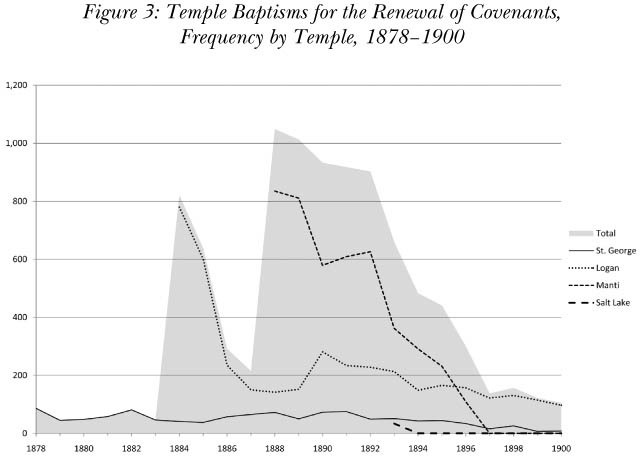 It appears only fairly recently that it has been explicitly tied to the renewal of the baptismal covenant. It is also true that people in the nineteenth century probably didn’t participate in the sacrament as often. Attendance of church meetings during that period wasn’t as regimented as it is today. I imagine after the reforms of the first decades of the 20th century to the time of the block schedule is when we will find the most participation in the Eucharist. Slight clarification. The Community of Christ already has open communion; no one checks whether those taking the emblems have been baptized in any Christian denomination. This one part of the document concerning the sacrament appears at first glance to refocus the sacrament on celebration on renewing the baptismal covenant, although it explicitly acknowledges the authority of God acting through the clergy of other denominations to make the baptismal covenant in the first place. Thanks FireTag. Though, I think there is a big difference between not checking and open communion. The LDS Church’s current policy is that non-members are not prohibitted from participating in the Lord’s Supper. Sometimes they have even been invited, but there are clear theological disparities in the meaning of the Lord’s Supper to these people. Doesn’t the idea of open communion require acceptance of ecumenical baptism? I guess what I am saying is that it doesn’t appear that the CoC has open communion. I think the CoC does practice open communion now, meaning that all who self-identify as Christian are invited to partake. For all intents and purposes, so does the LDS Church; visitors and investigators partake of the sacrament on a regular basis. The main exception are Latter-day Saints who have undergone church discipline. Another excellent (and fascinating) post J. Well done. Community of Christ does have an open table. (or nearly open) In Aug 1994 the First Presidency presented guidelines on the sacrament of the Lord’s Supper in response to WCR 1240 passed earlier that year at conference . which rescinded the close communion legislation (GCR 91) and requested the First Presidency to develop guidelines expressing the table is to be open, all to be served, and it would be the individual’s choice to take or not take. This potential change is pretty interesting. However, for me, more interesting than the doctrine or practice of baptism is the denomination-wide discernment process that the Community of Christ has engaged in this past year concerning baptism. I’ve attended three congregational meetings where members of different congregations shared their own thoughts, feelings, and beliefs about baptism. In all three, it was a very interesting and open experience where individuals expressed a wide, wide variety of opinions. From what I could see, baptism meant very different things to different people and there were very different ideas about practice. For example, one person who felt baptism was absolutely critical also believed that baptism was essentially a right and that if anyone asked for baptism, you should immediately offer it to them. His view was that the form was absolutely irrelevant — in other words, immersion doesn’t matter. He posed a scenario where a person was dying in a car crash and asked to be baptized and he insisted that it should be done then and there, even if there was no water available. Interestingly, this same believer in baptism, although he rejected the forms (even water!) as essential, still believed that you really needed to be at least 8 to commit meaningfully. So he had questions whether the church could accept someone’s infant baptism. That was just one example — I was impressed that these “discernment” meetings encouraged everyone to share their ideas. My feeling is that this was a perfect example of the Community of Christ’s theology of being a “prophetic people” — (they are not only a people with a prophet, they are a people who receive personal revelation together) — played out beautifully. As a result, I don’t see this policy change ending in a divisive way at all. Although people had differing perspectives and beliefs, they were open to different possibilities. I think the likely outcome here is that the church is going to embrace a policy that is in keeping with what most of the members already believe about baptism. GMAFB! You may be technically correct on polygamy because if someone so preach in BY’s Utah they’d have been killed first. But the on the ban, a number of LDS were exed for ordaining blacks (and women). LDS Cynic, your trollish comment is simply idiotic. I stand by my statement. More can be found elsewhere. Disbelieving is not synonymous with direct defiance. I am delighted to belong to Community of Christ. It is generally a progressive movement but there are many members who are extremely conservative. I find the leadership is mostly progressive. Nevertheless the diversity is refreshing. It would never do for me to belong to an authoritative church. I am also happy with the counsel to accept Christians on their original baptism.